What Type of Asphalt Mix is Right For Your Project? Contractors in the Wisconsin area have long-known that Wolf Paving is among the best sources for asphalt in the state, and one of the reasons for that is our extensive line of custom asphalt mixes. We have over 75 years of experience in asphalt mixing, and much of that has gone into ensuring we have the right mix for every occasion. Cost Control: There is no middleman to worry about, this allows us to offer our services for less than other contractors who buy from third parties. Total Mix Control: We know exactly what goes into our mix, and can assure you to the best mix for the job. Easy Recycling: 100% of the leftover asphalt and concrete we haul away from job sites is recycled into new paving materials. So you can rest easy knowing your project is eco-friendly. Most other asphalt company’s in the area don’t produce their own asphalt, let alone have such a comprehensive vertical integration of their facilities, and that's how we're consistently able to deliver a better product at competitive prices! 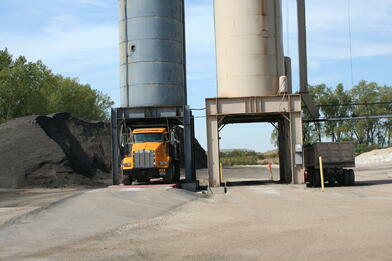 If you'd like to learn more, click here to read about the asphalt manufacturing process. So, if you're a contractor, which asphalt would be right for your next paving project? While we offer many custom blends with different thickness, granularity, and stress tolerances, the big choice in asphalt mixing comes down to how hot it is when it's laid down. Hot Mix Asphalt (HMA): This is the “standard” type of asphalt. The binding material and aggregate materials are heated to between 280-325 degrees Fahrenheit, and laid down while still extremely hot. HMA can generally only be laid in warmer months, as cold winter temperatures can cause the base to cool too quickly. Warm Mix Asphalt (WMA): Warm asphalt mixes are a newer form, and a compromise between hot and cold. They can be laid in cooler temperatures, hauled farther, and still set correctly, while still using less petroleum products than hot mix. WMA is currently used in about 30 percent of all paving projects, and is actually better for the environment and worker health because there is less dust, smoke and fumes when this asphalt is poured. WMA is manufactured at temperatures between 200 and 250 degrees Fahrenheit. If you are looking for a more in-depth look into the differences between hot mix asphalt and warm mix asphalt, read this blog. Cold Mix Asphalt (CMA): The asphalt is a blend of oils and additives that makes it possible for the asphalt mix to be stored and laid down cold. While methods for CMA mixing are improving, the results are generally not as strong as hot mixed asphalt. CMA is usually deployed for patchwork, potholes, or for lesser-used surfaces. To learn more about cold mix asphalt, and to see how its manufactured click here! 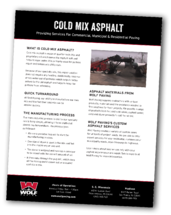 Or if you'd like a physical copy of a cold mix asphalt resource, download our free Cold Mix Asphalt Information Sheet. Looking to learn more about asphalt in general? Visit our Everything You Need To Know About Asphalt Paving page. With more than 75 years of paving experience, from highways to commercial driveways, we are your local source for all of your asphalt paving needs. Request an estimate and get on our list for upcoming projects! Call Wolf Paving today. For the Milwaukee area, call us at 262-965-2121. For the Madison area, call us at 608-249-7931.